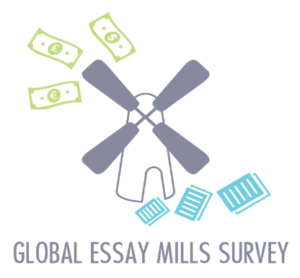 The project will survey students across Europe, Australasia and the Americas to investigate student self-reported use of essay mills and associated sites/companies. The survey will also gather student opinion on the companies, whether students believe the act should be illegal, what should happen to those who submit work that they have got from someone else and/or an essay mill, and what students themselves think motivates other students to use these sites/companies and engage in contract cheating. Further, the survey will gather data from students on their reasons for attending university. The project will provide an international consideration of the problem of contract cheating as well as comparisons between countries. 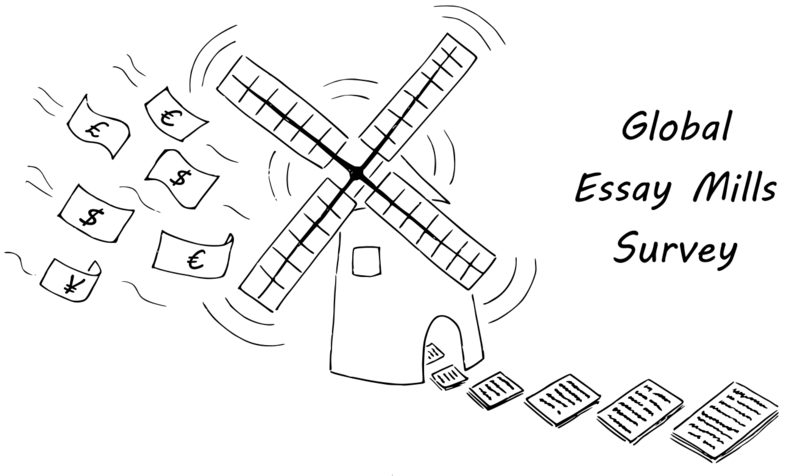 The use of essay mills in higher education is a problem frequently seen in the media. Various research has been undertaken to determine the reasons why students cheat, and the prevalence of the problem of contract cheating (see Beasley, 2014; cheatingandassessment.edu.au, 2016; Clarke & Lancaster, 2013; Collins, Judge, & Rickman, 2007; Curtis & Clare, 2017; Jones, 2011; Owings & Nelson, 2014; Rigby, Burton, Balcombe, Bateman, & Mulatu, 2015; Wallace & Newton, 2014). These studies have presented an array of data on student motivations for contract cheating and how frequently they are doing it, as well as repeat behaviours. However, these studies are focused in one country or university. This project will therefore provide a global comparison of students’ behaviours and interactions with essay mills, as well as being able to give a clearer picture of the extent to which students use these sites in English and other languages. The survey will be released across countries in the Americas, Europe and Australasia and therefore, will be the first study undertaken to compare student cheating behaviours across multiple countries, and continents. There are different methods through which students can engage in contract cheating, due to the differing types of sites available to them (for examples, see Tomar, 2015). This project will therefore ask students about their use of the different types of sites, and further, in relation to how they obtained work, whether it was free, in exchange for something, or for money. 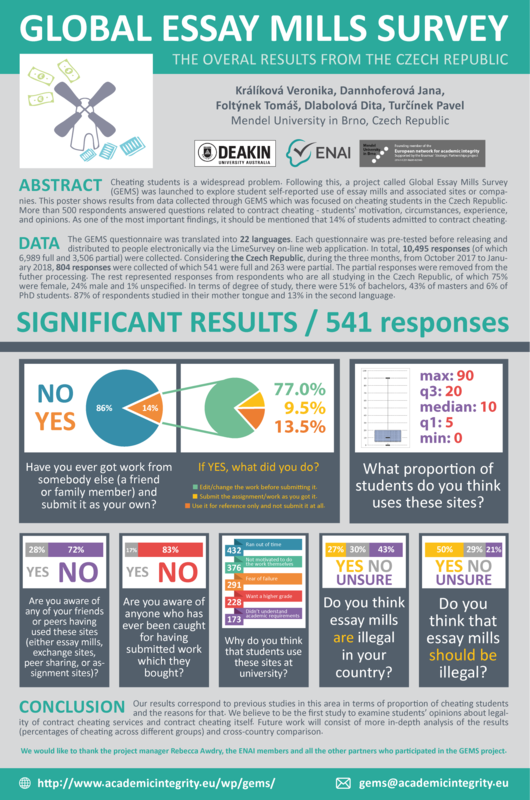 The researchers believe that this is an important distinction to understand the extent of the market and whether students are utilising some sites or methods more than others (for example, perhaps they are actually obtaining work from other students more frequently than they visit essay mills). The proposed project aims to combine two elements, one to consider students own study behaviours, reasons for being at university and why and when (if applicable) they have used essay mills, or obtained work from others. The initial section will also attain information from students on whether they have used any other source to obtain assessments or work which they can then submit as their own assignments (whether free or for money, and whether from companies or persons known to them, such as other students, or family/friends). The second element asks students to discuss other students’ prevalence and reasons for cheating, and what the outcomes should be for those who submit other’s work as their own. This part will also ask students their opinions on the legality of such acts, and whether any legal action should be taken against students or companies. 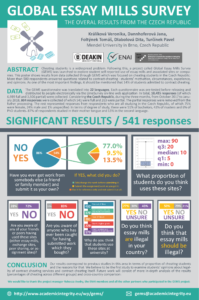 Some studies (Boman IV, Ward, Gibson, & Leite, 2012; D. L. McCabe & Trevino, 1993) have demonstrated that students’ perceptions of other people’s cheating behaviours and their beliefs in relation to the numbers of students using essay mills (or in undertaking any deviant behaviours), often reflects their own behaviours. Therefore, the survey will seek to compare these two elements to determine if there is any disparity in relation to the two figures. Finally, the survey will ask students to present their opinions on what the outcomes for cheating in this way should be, and whether they think these actions should be illegal (building upon findings of staff perceptions of essay mill legality by Awdry and Newton – forthcoming). The project has ethical approval from the University of Canberra (project number 16:71). For futher information, please contact HumanEthicsCommittee@canberra.edu.au.